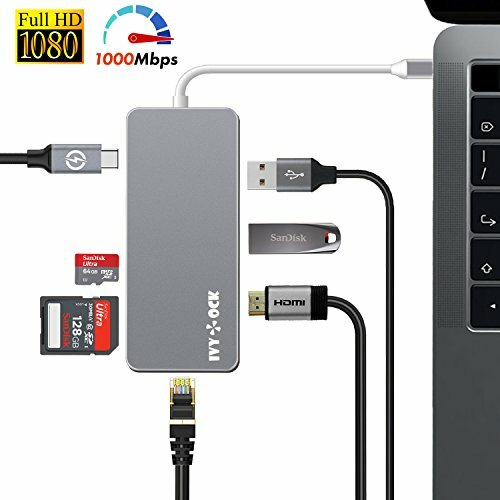 This 7-in-1 IVYOCK USB Type C Hub can instantly expand your laptop capabilities. And more other Type-C devices. For best performance, devices connected to USB Type C Hub should not exceed total current of 900mA maximum. Otherwise, output current may become unstable or disconnected. BUT when external power source is connected to the hub (please make sure that your laptop supports charging by adapters), the hub can support high-power devices. Please double check the specific rating of your devices before connecting to IVYOCK USB Type C Hub. 【7-IN-1 Instant Expansion】Expand your USB-C port to 7 ports : USB C Hub with type-c charging port, 1080P@60Hz HDMI Port, Gigabit Ethernet Port, USB 3.0/2.0 Ports, SD / TF Memory Card Slot. 【RJ-45 Gigabit Ethernet & HDMI Video Adapter】Enable you to enjoy the ultra-fast Gigabit Ethernet speeds and the reliability of wired connection directly. Support 10 / 100 / 1000BEST-T networks. 1080P HDMI Port Can Mirror or extend your screen with USB C Hub HDMI port and directly stream Full HD 1080p video to HDTV, monitor or projector. 【 Stable Connection & No More Overheating】With the newest line access plug, you won't have to worry about losing connection to your computer even by the slightest movement. Also you can use this USB-C hub with your Laptop case. We also improve greatly in heat radiating system. You can plug and play without the worry of overheating. 【Full Compatibility USB 3.0/2.0 Ports】USB-C TO USB 3.0 Ports Simultaneously connect up to USB-A peripherals and transfer data at up to 5 Gbps.The USB2.0 port Compatiable with some device can only support USB2.0 Protocal. Allow you to connect keyboard, mouse, thumb drive to MacBook Pro or other Type-C devices, and access files from SD / TF card reader. 【Ultra Fast Power Delivery】PD 2.0 USB C Adapter 60W Port. Charging your MacBook / MacBook Pro, Chromebook, Dell XPS, Lenovo Yoga or other type-C port devices while connecting multiple peripherals and transferring data. Power output: 5V～20V/3A. If you have any questions about this product by IVYOCK, contact us by completing and submitting the form below. If you are looking for a specif part number, please include it with your message.